Resonate is a music streaming co-op and a great example of a platform co-op which is changing the way business works. 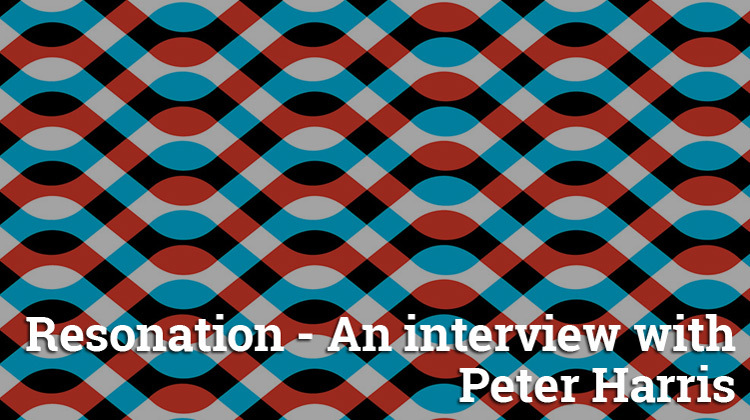 In the run up to the OPEN 2018 Platform Co-op conference we interviewed Peter Harris, Resonate Founder and CEO. OSB: I love your #stream2own model, it’s such a great way to charge for music – but I want to kick off by talking about money. On your blog you wrote “…we believe that it’s time people started looking at the politics of money” and the whole ICO craze does seem to be helping to kick off that conversation… I recently wrote something about the possibility of a Co-op Coin ICO… what do you think about the idea of a co-op coin to help expand the commons and the cooperative economy? PH: Absolutely. The 6th principle creates a plug and play framework for coops to do business with each other. Having that plus blockchain tech could be incredibly powerful, really helping to accelerate the process by which coops do business with each other. That’s a big part of why I’m so excited we’re working with RChain, the world’s first publicly owned and managed blockchain system. Their headquarters is in Seattle, Washington and we’re just getting started on the process of founding the European HQ here in Berlin. There will be a phase of stewardship from the existing RChain board in the US, but this will very quickly become a fully independent organization. One of the founding members is Ela Kagel who organizes the Platform Coop Berlin working group and we’re super excited about the possibility of the European HQ for RChain having a mandate to further advance the platform coop agenda. Very early days, but a bright future indeed. OSB: Can you tell us more about your partnership with R-chain? What will it mean for the ownership and governance structure of Resonate? PH: RChain is building an entirely new blockchain system that is an ideal solution to scale a music-based network with high transaction volumes, something that can’t be done on other systems. They’ve funded us through one of their venture arms called Reflective, providing us with the necessary resources we need to have a dedicated team working in development, outreach, marketing and more. Nothing in the partnership changes the essential nature of Resonate’s ownership and governance structure. Once a co-op, always a co-op. Where things will get really exciting is that since RChain is also a co-op, with an international membership of well over a thousand, I think there’s tremendous potential for them to build a whole new set of tools for co-ops to administer their affairs. Based on blockchain that means an incredibly high level of security, plus the trust of being able to track development in organizations in really solid ways. OSB: I’d love to see Rchain based tools to help co-ops get organised! Can you explain any more about the Rchain investment? PH: RChain’s investment arm, Reflective, is investing $1M in Resonate. It’s funding development in our player (which is still in Beta now, but we’re working on delivering the full service). This will include a new membership system, the identity system in collaboration with Mycelia, a new website, and more. The investment is also funding outreach and marketing, allowing us to partner with a number of organizations supporting independent culture. OSB: Great – can you tell me anymore about the organisations supporting Indie culture? PH: We’ve joined organizations such as the Association of Independent Music, the Association of American Independent Music, Music Managers Forum and Featured Artists Coalition. They are trade organizations supporting the independent music industry. We’ll be working with them in a number of ways, for example, we recently sponsored AIM’s annual Music Connected, and I spoke as part of a panel on streaming and the music industry. Our board member Terry also appeared at their collaboration with the Great Escape, hosting a fireside chat with Imogen Heap of Mycelia and Ninja Tune co-founder Matt Black. This gives us a great opportunity to be visible, and also facilitate important conversations around music today. These organizations also have extensive networks throughout the industry. This helps us promote the Resonate message, as well as communicate with a range of artists, labels and industry organizations. This will help us boost our catalog, but it also sets us apart from other players in the music-blockchain space. We know the industry well and are working with it. OSB: How big is Resonate now – and what plans do you have to grow? PH: There are about 15 of us on the core team. A number of people have also gotten in touch and want to become volunteers. We may eventually expand our team, but that won’t be for a while. More people are signing up to Resonate each and every day. Currently, we have ~3100 artists and 400 labels signed up. OSB: That’s brilliant – can you tell me how many members there are of the co-op – listeners that have signed up? PH: Close to 2500 listeners, which is based on minimal press and no marketing. Our focus has been more to the artist side of the community, so we haven’t done much, if any, direct outreach to listeners yet. But there are a lot of plans ready to implement to grow the listener base, so that’s not a concern at the moment. 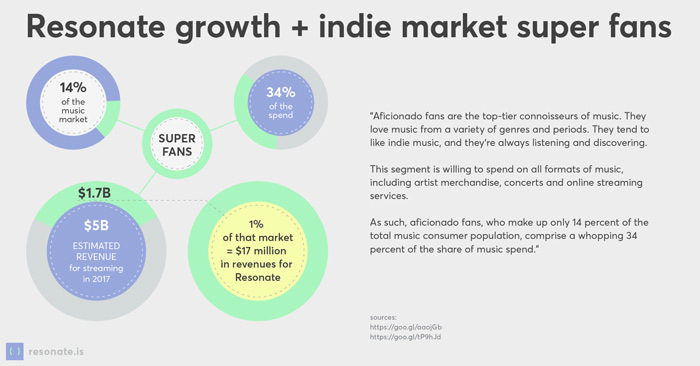 We are working with a number of trade organizations in the indie music space, which will help us connect to their networks, raise awareness about Resonate, and grow our catalog. We’re also working with prominent indie labels and distributors, so as more artists upload their music to our player, we will organically attract more listeners. Resonate is about sustaining independent culture, and central to this is building an environment in which independent artists can succeed. The issues that effect the music industry don’t stop at streaming, so we’re working to expand our services, too. More information on that can be found on our ‘Plan for Growth’ page. OSB: I love the idea of Embeddable playlists for curators, it makes loads of sense… do you have any idea when that might come online? PH: Hopefully later in the year. Is anything like that on your road map? PH: Yes, definitely. A lot of work has gone into looking at the various ways people share music and what the larger dynamics are, so you can expect to see lots of functions like that in the coming years. OSB: The other ideas in the Plan for Growth all sound great – we will do our best to help promote 🙂 How is the Resonate co-op structured in terms of membership classes? PH: We have three primary membership classes with voting rights – Music-Makers (artists and labels) have 45%, Fans (listeners) have 35% and Collaborators (workers, contractors and volunteers) have 20%. We also have a Founder Membership class which have some extra influence in the appointment of our board in the initial stages of our development. OSB: Can you tell me anything about the way that decisions are made at Resonate? PH: Decision-making happens within different forums depending on the type of decision being made. At the moment, our organisational structure is still in flux but we are trying to get a balance right when it comes to question of hierarchy v. flat organisation. But in principle we have a relatively traditional co-operative structure. The Resonate board is elected by our members (the first board was elected by our Founder Members), and delegates the management to our Executive Team who then co-ordinate our different collaborator teams. Many decisions (like amending our rules) are left to the members in General Meetings. Our Collaborator members are actively engaging with resources on collaborative working models (particularly the great Loomio Handbook) and are implementing some of these ideas into our workflow. OSB: Can you tell me any more about the Resonate partnership with lifeID? What does this mean in practical terms for members / and the wider community? PH: When it comes to decentralized systems, identity raises many major questions. If there isn’t a centralized authority to verify identity, how will people be able to access the system if they get locked out? What happens if someone tries to profit off of someone else’s work? We’re working with LifeID and Imogen Heap’s Mycelia project to build an intuitive, practical solution to this. It means that users will have different options for access, and that we have a way of verifying that someone uploading music to Resonate is, in fact, the correct rights-holder. LifeID are working on self-sovereign identity, which puts users in control of their information. This means that users can own and manage their identity and data, and so user privacy is privileged. Our collaborations focus on an identity system that will be based on real-world relationships, allowing users to prove their identity without disclosing sensitive information. It will help us verify people’s real-world connections, sidestepping the prevalence of bots that plague life online today. OSB: Does that mean that LifeID is using something like a Web Of Trust – rather than for example “what is your mothers maiden name?” i.e. using my relationships to verify my ID rather than data which someone may have compromised? PH: That’s what we’re working on. We are still determining what our identity system and what our collaboration with LifeID will look like. Ultimately, we privilege user privacy so it’s important to us that we come up with an effective system for identity management. PH: There’s a good question as to whether any of us has seen this within our lifetimes. Certainly not on a national scale where elections have been fully manipulated through mass media spending since the advent of television. Real democracy to me is high engagement and equal access to participation. These are often blocked through a climate of apathy and organised disenfranchisement. Probably the recent election in Cuba is one of the better examples of a robust process. OSB: Since members of co-ops and platform co-ops get to vote on everything and anything by which they are affected, a society populated by a multitude of co-ops could possibly provide an alternative system of governance. A global co-op of smaller co-ops could perform organisational duties at any scale whilst ensuring democratic governance by pushing decisions down to the lowest possible levels. What do you think about the possibility of a completely new system of democracy, like the above, superseding the existing system? PH: I think it’s both necessary and inevitable. It is quite clear that most Western “democracies” are actually oligarchies under corporate control. The mandate of the corporation is to return value to shareholders above all other concerns and this has led to some fairly dire consequences for people and planet. Climate change action has been stalled for decades directly due to the influence of corporate denial campaigns, so the situation really couldn’t be more urgent than it is now. PH: Get everyone on rchain.coop so we have a common, shared infrastructure to work from. If you want to learn more about Resonate, LifeID, Rchain and how you can get involved, Peter will be speaking at OPEN 2018 in London in July. Many thanks to Mollie from Resonate for help with this article.